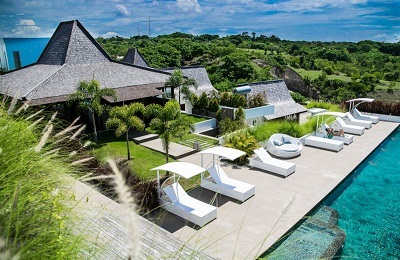 The Bukit island boasts a wide range of top class reef and few sandy beach breaks including Padang Padang, Uluwatu, Bingin, Impossibles, Balangan, Dreamland, Green Bowl, Gunung Payung and Nusa Dua — all within short distance from the surf camp. 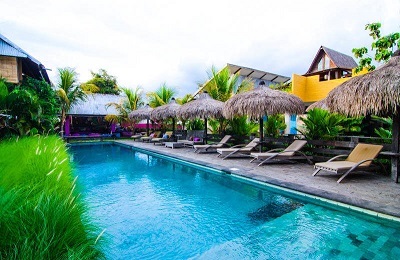 The Green Bowl surfcamp in Bali offers different surf and accommodation packages ranging from a first-class resort experience to affordable backpacker accommodation. We provide surf guided tours round the fascinating island of Bali and surf lessons too run by surfcamp owners.. surfers who love to teach surfing and this way of life ! Our facilities are located only 80 metres from Green Bowl surf spot.. If you are tired of surfing, our surfcamp will offer you a wealth of relax at the its balinese gardens or guided tour of the island. We provide accommodation with half board service. Daily health Breakfast and delicious dinner included 5 days/week. For backpacker looking for a budget solution, we have a 6 beds dorm with air conditioning and shared bathroom facilities. 2/4 hours per day with materials and transportation included All levels of surf class (beginner, intermediate, advanced) with the assistance of qualified Australian surf instructors. We recommend to beginner surfers to add to your package the surfboard insurance. Available in all shapes and sizes of the board from shortboard 5’10ft up to 9’4ft fiberglass and soft boards with a leash. Transportation to the main surf breaks and secret spot, only for intermediate and advanced surfers. Perfect combination after a whole day in the water. 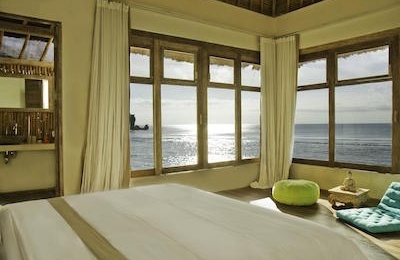 We are located, 8 minutes far from the beach, midway on the southern coast of Bali’s Bukit Peninsula, behind the Ungasan hills. Green Bowl good famous waves with small crowds (25 persons max) of a remote beach. The natural seclusion of the beach means that you won’t have to share this spot with a lot of other surfers. Close by warung (small family-owned shop or café), half hour from the busy center of Kuta where you fing big markets, restaurants and the International Airport. Ngurah Rai International Airport (DPS) also referred to Denpasar International Airport is the main airport of the Island. Also, try to search for flights to Jakarta and then take a quick domestic flight to Bali. Tourists are permitted to bring 3 surfboards into Bali for personal use. Any boards beyond the allotted three will be counted as imports by the Indonesian government and subject to a customs duty of around $100 US dollars per board, though this fee is often negotiable. The currency of Bali and Indonesia is the Rupiah. It is best to arrive in Bali with a valid international debit card such as a Maestro (EC) or a widely accepted credit card. Note that your passport must be valid for at least 6 months and have an empty page for the visa stamp. Plastic bags or cases for waterproofing electronics and valuables. All above accommodation prices include breakfast daily and dinners from Sunday till Thursday as well as trips to surf spots and guided surfing twice a day from Monday through Saturday, plus information on Bali’s surfing locations. "We have spent a very nice, intense and relax week in this surf camp. Despite that the place is a bit far from everything, it is easily accessible woth a motor bike. I can remark that the place is magic, paceful and calm. The surf clourses are very nice, with good teachers and every day they find a different beach to practise some surf! Even the surf guiding is good! The pool was amazing as well! And the atmosphere awesome! It was very confortable to have the breakfast and the dinner included, even if I think that maybe two options for te dinner could be a good point (in case someone don't like the dinner and takin into account that there is no bars/restos close to the place. The only negative point we have found was the proce at the bar. The prices were quite high (same proce or more expensive than in famous bars of the zone) or even in comparison to the bars on the beach (Bingin, Uluwatu)... But, in general, we can say that we have spent a super holidays in this surf camp and we would like to come back in the future!! :)"
I had an absolutely amazing time! "The owners Josh and Maggie provided a great setting which then was filled with great people during my stay there. The camp itself is brand new with a lot of open space and several great areas to hang out in after the surf, with an ocean view to top it off.The dorm was super fresh, the beds were made on a daily basis and towels was provided.."